Ashley’s linen napkins embroidered with silk ribbon are gorgeous! Hemstitched linen napkins served as the ground fabric for her first forray into embroidery. This sumptuous spray of flowers is so beautifully executed that it’s hard to believe the project comes from a beginner in silk ribbon, let alone a beginner in embroidery in general! I have never embroidered before and picked up Country Bumpkin’s A-Z of Ribbon Embroidery while in a needlepoint store and found it simply irresistible! Knowing nothing about embroidery and especially ribbon embroidery, I typed the supply list into a search engine, ordered the products, and waited on bated breath to begin my new project! The design is called “Desprez a Fleur” by Lynda Maker. The roses are a gathered ribbon rose with two ribbons (a 7mm yellow ribbon and a 4mm pale yellow) stitched together to give it some depth. 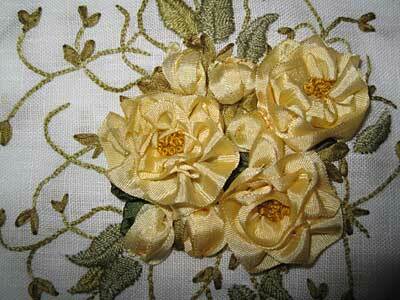 In the center of the roses are little French knots out of gold Madeira silk floss. 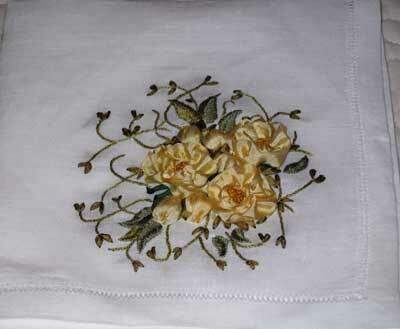 The rosebuds were made by covering a pearl bead with ribbon stitches. The design called from glass beads; however, I decided that was a bit impractical for a napkin, but then so is silk ribbon embroidery! These are definitely going to be “looky lu” napkins only! freedom, creative expression, and delicate femininity involved in embroidery. Needlepoint canvas can be rather limiting, even with all of the stitches that are available today. As my Mom says, needlepoint is earthenware, while embroidery is delicate fine china. I think my next undertaking will be goldwork on a Bible cover. I have been needlepointing a Bible cover and I am just about finished, so I thought maybe I would try an embroidered cover after seeing one of your posts on them. I begin an internship as a hospital chaplain in the fall, so I figure there’s no such thing as too many Bible covers! I know I am probably being a little over ambitious to move straight to goldwork! But I have a touch of youthful hubris– if others can do it, why can’t I too?! Thanks, Ashley! Um… I think if you launched this easily into silk ribbon embroidery, you should have no problems at all trying your hand at goldwork! Best of luck! I second Mary's feeling that you'll have no problem with goldwork. Just follow the basic instructions (add A-Z of Goldwork to your library – it's great) and your Bible covers should turn out beautifully. I followed pretty much the same path (cross stitch to ribbonwork to goldwork) over the course of three years, mostly self-taught but with the support of my local EGA chapter. Goldwork and ribbonwork seem to either be acquired tastes OR they must be so intimidating-appearing that some embroiderers tend to shy away from them and designate them as "hard," "difficult to master" or the kiss-of-death "way too tricky!" The truth – or secret – is, as you've discovered with those gorgeous napkins, that you get a whole lot of "bang for your buck" with fairly basic techniques. So keep charging ahead – and make sure you keep reading Mary's blog. Not only the daily posts, but the past ones all related to goldwork. They'll REALLY keep you motivated! Beautiful work…wish you the best for your future projects Ashley! love the colour choices as well. i love embroidery of all types…thread ribbon etc.this is very help full site and i m used to see it often. I just read about beginner, Ashley’s foray into silk ribbon embroidery, and feel like maybe I shouldn’t be so timid about trying it. I am a passionate quilter who loves anything to do with thread, needle and fabric. You mentioned using SRE on a Bible cover and my eyes surely must have widened. I’m in the process of making a quilted Bible cover for a dear friend for Christmas and believe I will do some practice work and then try to add that to the cover. Thank you for all that you give those of us who love to embroider, but need guidance. You are amazing. 🙂 I hope you try it, Betty!! I’m sure you’ll find it rewarding – and it’ll be a breeze, since you’re already a needleworker!